"Follow the Leader!" 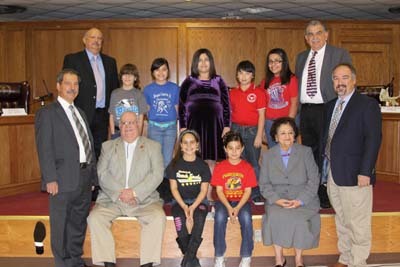 Rio Grande City Consolidated Independent School District celebrated Board Recognition & Appreciation Month on Tuesday, January 18, 2011. Rio Grande City CISD is honored to have seven exceptionally talented and dedicated people leading our district. Our school board members set the standard of excellence that our district is known for and spend countless hours working to ensure the continued success of our schools and all students! Ringgold Elementary student Marian Meraz had the honor in presenting Mr. Roberto “Bobby” Gutierrez with an Oxford pair of shoes and an Oxford shoe cake. Oxfords are traditionally constructed of leather in a range of styles and materials for both casual and formal forms of dress. Mr. Gutierrez has a unique style when it comes to his leadership in our district. He artfully executes his stylish flair to be able to achieve success. That is why Ringgold Elementary presented Mr. Gutierrez with oxford shoes. On behalf of Ringgold Elementary School we would like to say THANK YOU to Rio Grande City CISD School Board Members for your hard work and dedication! !